The NCWRC John E. Pechmann Fishing Education Center located on the west side of Fayetteville opens the facility on the 2nd Wednesday of each month to honor our fighting men and women. We are open, rain or shine and have plenty of classroom space and planned activities in the event of rain or extreme cold. 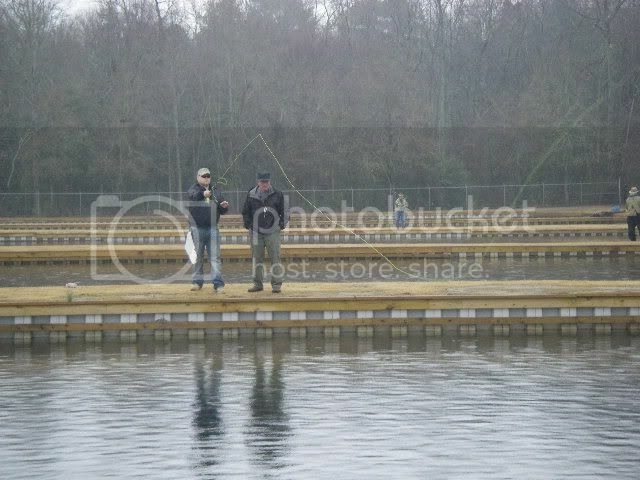 A small handful of soldiers and retired military veterans showed up today to kick off of our 2012 monthly Wounded Warrior & Military Appreciation fishing events. 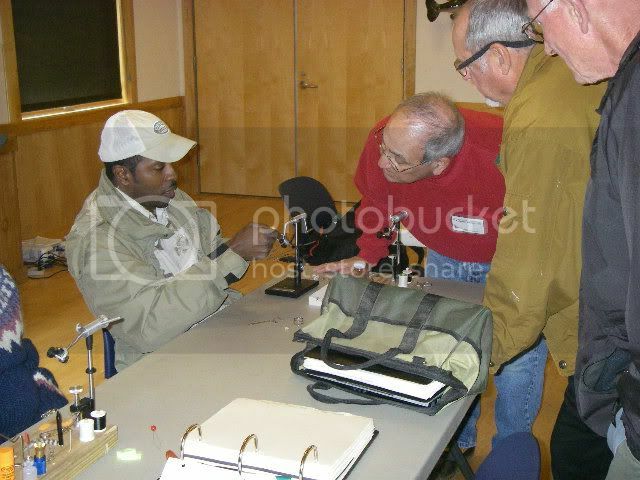 Volunteer fly tier John Smith, himself a retired veteran, has a knack for teaching novices the art of fly tying. It is doubly sweet when they take their new creation to the trout pond and it actually catches fish. Today's secret fly was the egg pattern. This Wounded Warrior had never picked up a fly rod before today. The light turn out enabled us to give a lot of one-on-one help. 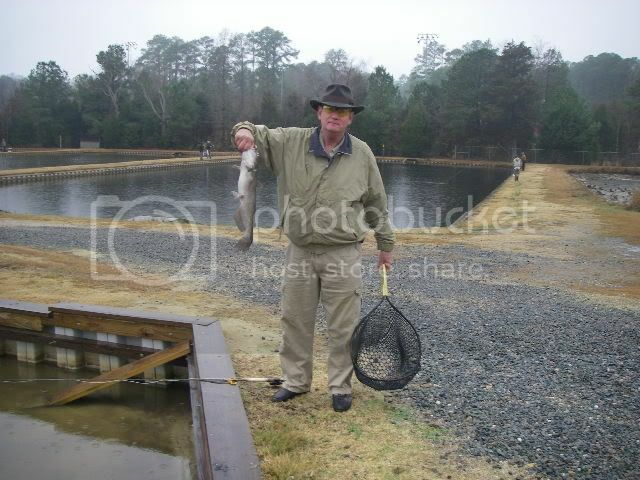 Looks like our volunteer casting instructor showed him a thing or two! Not a lot of fish caught today. I think the adverse weather put them off their feed. I personally "tested the waters" yesterday and caught so many that I ran out of fingers and had to take off my shoes in order to keep an accurate tally. A catfish this size really puts your fish fighting skills to the test. They are fairly easy to hook but not so easy to land. Put too much pressure on them in the beginning and they will break you off. 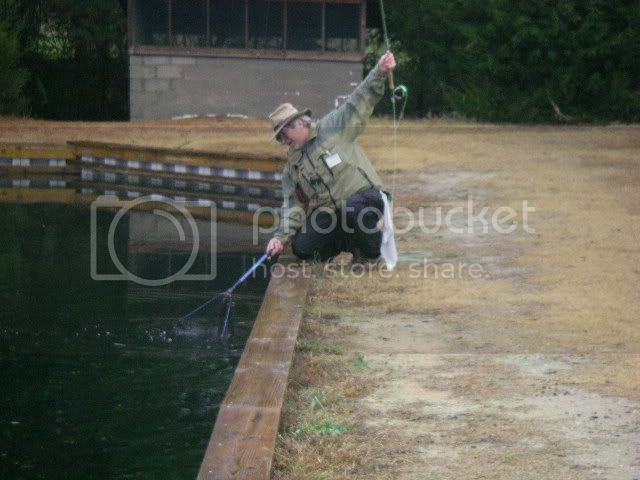 Mess up at the end and they can easily break your rod. Not a big crowd today but we will blame it on the weather. We have trout in our ponds and they will be with us for at least two more cycles of Wounded Warrior / Military Appreciation events. Our next next one will be Wednesday, February 8, 2012. We specialize in fly fishing but have over 200 spin casting outfits for those who want to dunk a worm or try some "stink bait" on the catfish. Family members are welcome. If the kids are in school we don't mind if you arrive a little late with them fresh from the school bus. Hours for these events are from 1:00 - 5:00 pm but if the weather is nice and the fish are biting we can be talked into staying a little later. You might also be interested in signing up for one of our fly fishing clinics. We have basic clinics scheduled for Jan 21st and Feb 4th, an Advanced Clinic on Feb 18th, Boy Scouts on Mar 10th and Mar 24th. All dates are on a Saturday with a start time of 9:00am and end time of 3:30pm. Registration through Lake Rim Park (424-6134). The cost is $5. Pre-registration is required. The basic clinics fill very fast so pass this information along to all of your friends.